Nottingham City Museums and Galleries were keen to know more about a painting simply titled ‘Industrial Scene’, donated in 1938. The artist, John Wilson Carmichael, ‘was born in Newcastle and was based there in his early to mid-career before moving to London’. It was also found later on in the discussion that the donor family were also Newcastle-based. Andrew Greg was first to note that the artist often painted industrial scenes for colliery owners in the north east. This painting appeared to be South Hetton Colliery near Sunderland. South Hetton is near the river, and the colliery shipped its coals via Seaham Harbour on the coast. Amy Concannon pointed out that the work is similar to a larger work by the artist at The Yale Center for British Art, a 1843 ‘View of Murton Colliery near Seaham, County Durham’. 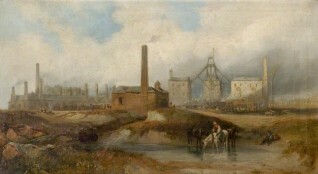 Andrew Greg indicated that this colliery was also owned by the South Hetton Coal Co., which implies owner Col. Thomas Braddyll commissioned both paintings. There was a brief discussion on whether Nottingham’s painting could actually depict Hebburn Colliery, but finally Andrew Greg asserted that the illustration of South Hetton colliery in Penny Magazine matches the Carmichael painting. The collection accepted the scene is South Hetton Colliery, near Sunderland, and noted the title should be changed accordingly. Editor’s note: this change will appear on the Your Paintings website by the end of July 2015. Can you identify the location of this 'Industrial Scene'?